I'm always looking for easy recipes to make for my 15 month old. She's fickle like her mom, and when it comes to food, there's no knowing what she will like to eat on any given day. 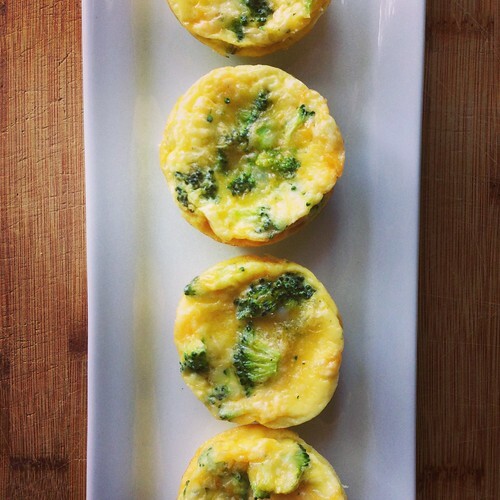 I was sure that these frittatas, full of her favorite ingredients, would be a hit. Alas, it was not meant to be, but I can still guarantee that they're delicious. And so easy! My hope for you is that whomever you serve this to does not dump it on the floor. These freeze really well - just cool to room temperature and pop them in a freezer bag. To reheat, warm in the microwave for 1 minute. 1. Preheat oven to 350F. Spray a muffin tin with nonstick cooking spray or line with cupcake wrappers. In a large bowl, beat eggs well. Add remaining ingredients and stir to combine. 2. Divide egg mixture evenly among 12 muffin cups. I find a cookie/ice cream scoop is the best way to do this. Bake until set, 12-14 minutes. Let cool for 5-10 minutes before removing from pan and serving. *I steam broccoli by placing it in a microwave-safe bowl with a half inch of water, covering tightly with plastic wrap, and microwaving for 1.5-2 minutes. You can also boil it on the stove for 3-5 minutes or use a steamer basket. These look so good...can't wait to try them for my little guy...he's recently turned into a picky eater, but has been trying and liking new things and new combinations of foods, so hopefully these will be a hit!